Causeway Watersports, located directly on the Roanoke Island Sound in Nags Head, North Carolina, makes watersports easily accessible and fun for your entire family. 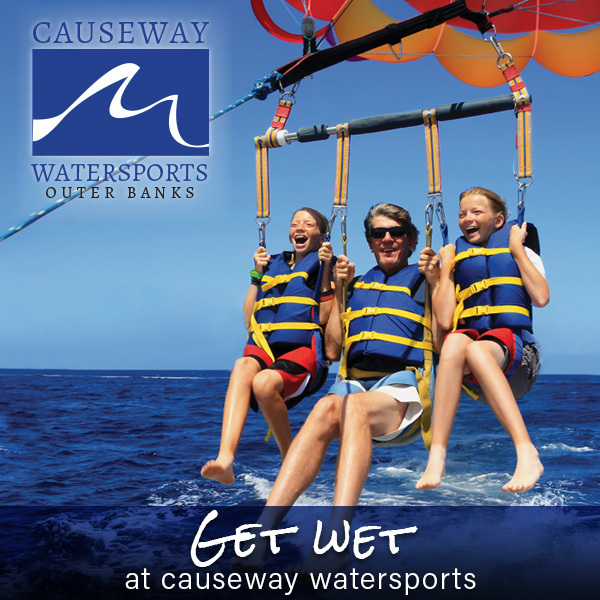 Causeway Watersports is the best place to enjoy Outer Banks watersports. We offer Nags Head Waverunners and Nags Head parasailing rentals. Our friendly staff will make sure you have fun on your Outer Banks vacation. Take flight and soar the skies over the Roanoke Island Sound. We offer safe, family fun on your Outer Banks parasailing adventure. All ages are welcome (at parents discretion). Fly single, doubles or triples. Fly with friends or family and make it an unforgettable experience. Check out our incredible parasailing flight deals at any height. Call us to Fly Now! Take a guided Waverunner tour through the sights of Nags Head and Roanoke Island where you will see ospreys, dolphins, the Bodie Island Lighthouse and more. Or rent a waverunner and adventure off on your own. Jet-skis can be rented for 1/2-hour or 1-hour times.